This fluffy menace harnesses the power of nature and is capable of dealing damage with energy balls. His true mission is to provide help for his party and carry his team to victory. 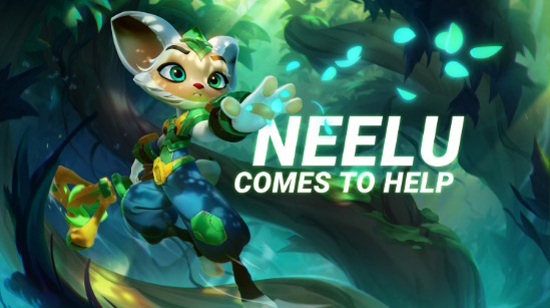 To heal his friends, Neelu can surround himself with a special buff that has 10 charges, auto-aiming for the most damaged friendly hero in range. Until this charge depeltes, this buff will keep helping surrounding heroes including caster himself. Putting his life on the line, Neelu can save gravely wounded allies, protecting them with energy shields and restoring their health. He is able to plan his retreat with precisely aimed balls of damaging energy and rush away to safety to restore his own health to get ready for the next brawl. This hero is ideal for those who are dedicated to their team and like fast-paced action. Planet of Heroes is an action-packed modern MOBA for mobile devices that aims to capture the essence of what makes the genre great on PC, while playing to the strengths of mobile platforms. Planet of Heroes makes the most of the mobile experience, allowing for both simultaneous head-to-head online play, and asynchronous offline play. Game controls are tailored to make the most of mobile devices, eschewing awkward gestures and control layouts in favor of friendly, easy-to-grasp control schemes. The new public test for Planet of Heroes is currently live for iOS and Android devices.